Ever one for experimentation, LG didn't bat an eyelash when introducing the G5. Life is good when you play, the message on the giant screen reads, as LG execs talk through the features of the new flagship, and if nothing else, we've gotta commend the seemingly reinvigorated company's nerve. 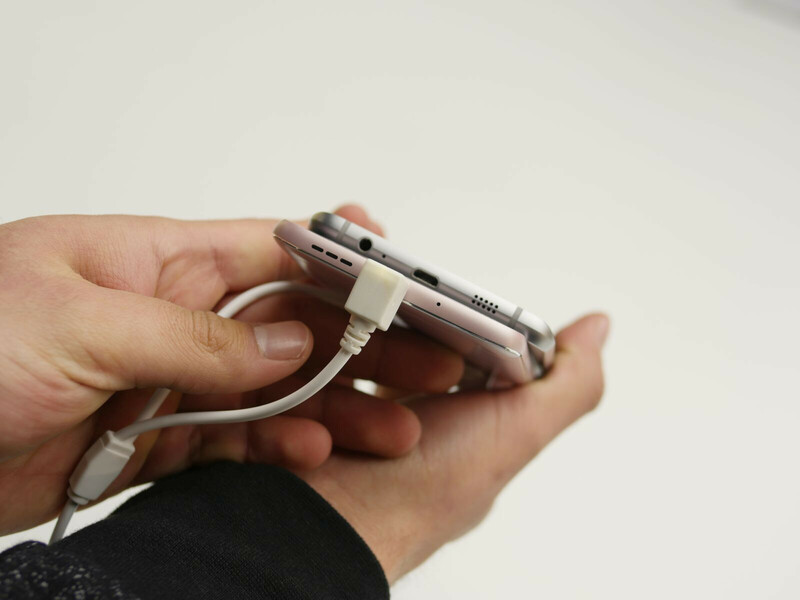 You see, the LG G5 is not your typical smartphone and features a modular design that allows you to remove the bottom portion to access the battery and even exchange it for something else that you'd like. Put next to the comparatively conservative iPhone 6s Plus, it definitely stands out with its weird mechanism. As you can imagine, design is one area where the G5 differs from most any other smartphone on the market. But if you look past the removable 'pants', things get simpler. Made out of metal and slimmer than ever, the G5 is nevertheless not the most strikingly beautiful smartphone that we've seen. 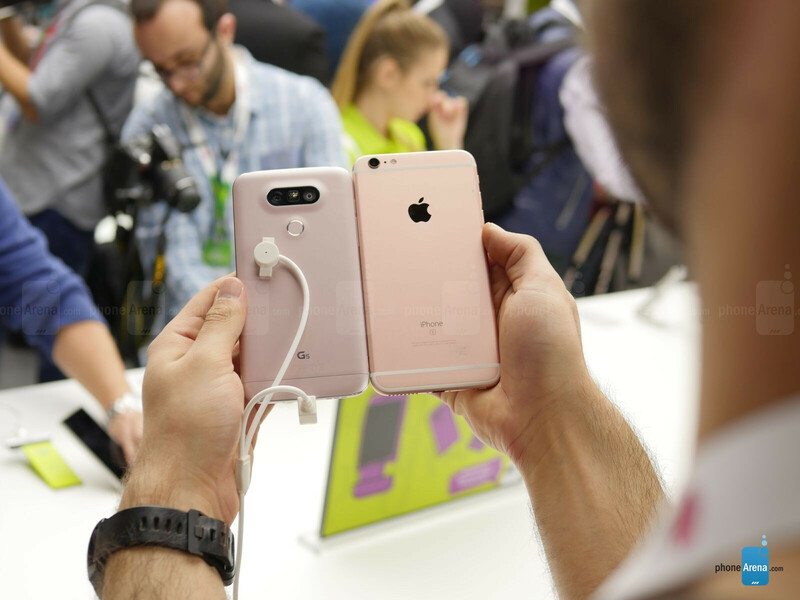 The lines of the phone are well thought out, and the smaller, 5.3-inch display helps with the handling, but if you asked us, we'd still say that the iPhone 6s Plus is the overall more stylish of the two. 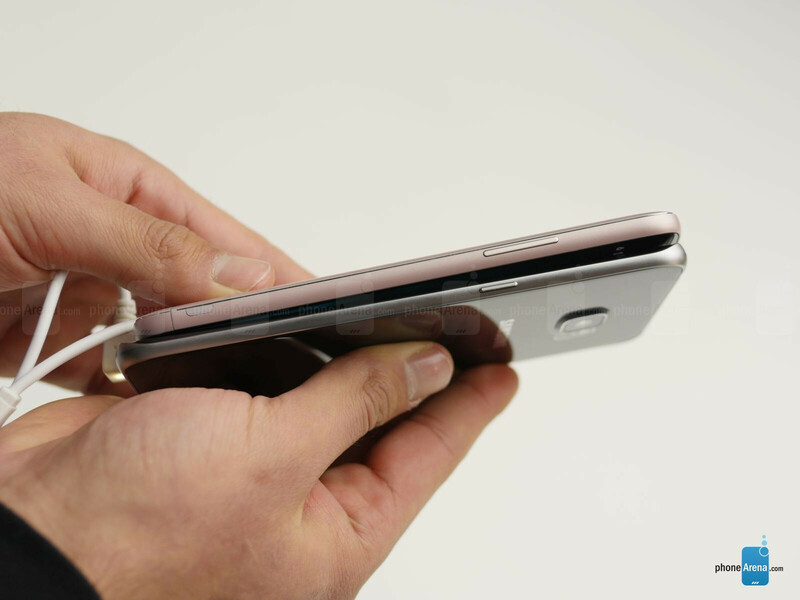 It's not the more practical for sure, however, as it towers above the LG G5 and weighs significantly more. 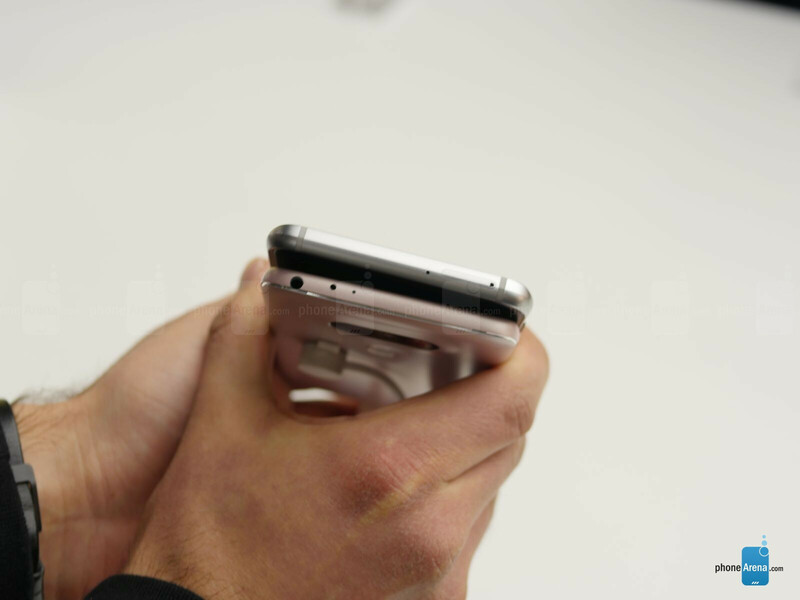 Quite frankly, while the G5 is by no means a small phone, we can see how one-handed usage would be an option, whereas with the iPhone 6s Plus, the width just makes anything but two-handed use a liability. So for the G5, LG is going back to a more manageable screen compared with its last two predecessors, and the 5.3-inch IPS panel sure looks good in person. As mentioned, you'd think that the iPhone 6s Plus has more than a 5.5-incher itself considering how much bulkier it is put next to it. 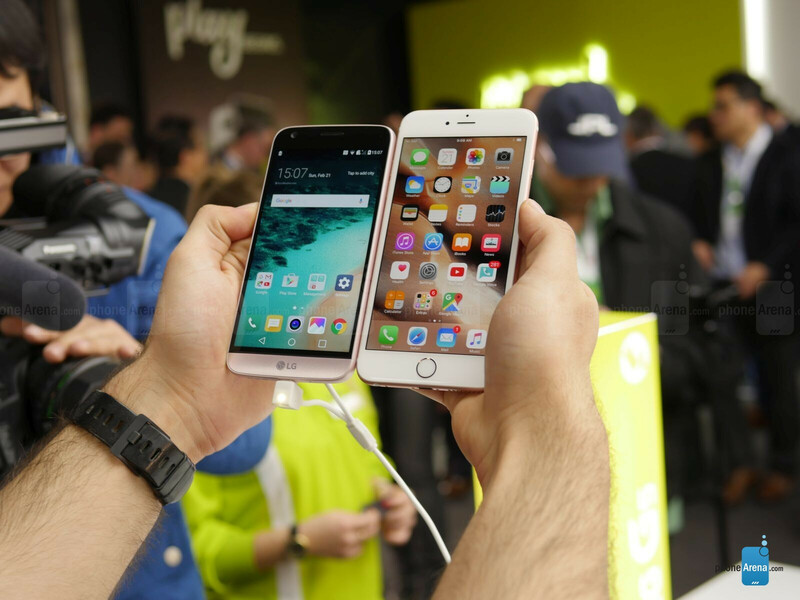 In terms of resolution, the LG G5 boasts the same Quad HD arrangement we've gotten used to, while the Apple camp is keeping things sane with a more power efficient, 1080p screen. Given how virtual reality is something of a topic at this year's MWC, it's worth pointing out that, if you'd like to try it out, the G5 would be the undeniably superior pick. Beyond these technicalities, it's important to point out that both devices offer advanced display functionality, with the iPhone 6s Plus relying on 3D Touch to allow for quick actions throughout the interface, while the G5 features an always-on display that shows you the time, date, and notifications even when the phone is sleeping. If you like having a say in how your smartphones looks and even functions, LG's custom skin, based on Android Marshmallow, is probably the more logical pick. Interestingly enough, however, the layout is more alike to the iPhone 6s Plus' iOS than before, what with LG dropping the app drawer for good. In result, you'll have to organize all your apps into folders, or suffer the chaos—just like on iOS. One distinct advantage with Apple's iOS that many Android users often underestimate is the richer app selection. That's not to say that the most popular apps aren't available for Android as well, but it's certainly true that there are some omissions and that apps generally hit the iPhone first. Another key differentiator, especially if you live in the US, is that you get Apple Pay with the iPhone, while the competing Android Pay solution available with the G5 is just starting out. Finally, from our testing, we definitely feel that LG could improve upon the fingerprint scanner integrated into the power button on the back. While we won't go as far as to presume that a few dozen test unlocks are enough to judge accuracy, they're enough to indicate speed, and LG is definitely lagging behind in that area. In comparison, the iPhone 6s Plus unlocks quicker. After the disastrous Snapdragon 810, Qualcomm is back in the game for 2016, and the LG G5 is among the first devices to offer its flagship Snapdragon 820 chipset. A quad-core solution, the Snapdragon 820 performs admirably from what we've seen from benchmarks and in person so far, and drives the rather heavy LG interface with ease. In Apple land, it's all about its custom-designed, dual-core A9 processor, which only sounds under-powered. In reality, the chip has proven to be one of the best in the industry, specifically when working in concert with iOS. To that end, the transitions and animations with the iPhone 6s Plus are rendered smoothly, while gaming is also a breeze. Ultimately, which is faster as far as benchmarks are concerned is a meaningless question. In the real world, both operate smoothly, and that's what you should care about. As mentioned, LG likes its experimenting. And it if you think about it, the V10 likely served as the test bed for the main camera of the LG G5—a dual sensor solution that allows you to capture up to 135-degree wide photos. Of course, to do so, the LG G5 will revert to the secondary, 8-megapixel sensor. If you're willing to settle for a narrower image, you can still make use of the 16-megapixel, optically stabilized camera from the G4. In comparison, the 12-megapixel snapper of the iPhone 6s Plus sounds pedestrian. Sure, it's also optically stabilized, but the field of view of the camera is noticeably narrower. That said, Apple has made sure that the snapper is very competitive in terms of imagery, though the age-old issue with overly warm shots still stands. It'll be interesting to see how the two compare once we've had more time to spend with both snappers. 2016 sure is shaping up to be an interesting year for smartphone buyers, and the LG G5 will certainly appear on many a shortlist. As in previous years, it's possible that LG will price it competitively and, given time, its price will make it one of the best deals around for those of you looking for a flagship. In comparison, iPhone 6s Plus pricing will only slip a little bit as we get closer to September. Speaking of dates, the LG G5 is expected to hit "tier 1" markets sometime in April, so we can assume that the Big Four carriers in the US will have it up for pre-order either by the end of next month, or early on in the following one. If you're an existing iOS user looking for an exciting new toy, the G5 fits the bill perfectly. Sure, it'll strike most as the geekier of the two, but since when is that a bad thing? LG's skin is looking good now not as bad as last years version i think. I hope LG will release capacitive buttons module as well. Why there are no additional flash lights on camera module? it is for additional camera functions and contains 1100mah battery, so why not it should have additional flash lights? Yeah, like a xenon flash. Phones have been needing a real flash for years. I miss the xenon flash of my trusty Nokia N82. Not bad lg. If it does not spoil the price lg buy a G5 and say what you like G5 to me more and more like it. Love the G5. Aiming to upgrade to that instead of my planned S7 upgrade I had in mind earlier. There's no comparison. The 6S is better in every way. LG had a chance to follow up after two failures and they failed once again. It's safe to say LG will not be a substantial player anymore. I shouldn't entertain an iSheep like you Mxyzptlk. Especially when you said LG failed with out giving any reason's. However in this comparison the iPhone 6s plus will be more expensive than this new G5. 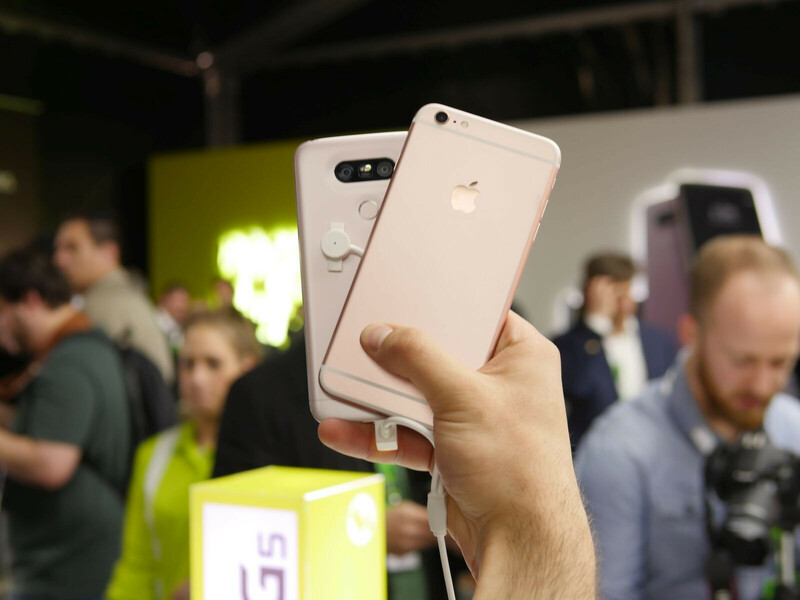 The G5 has better cameras, more ram and storage, a better and much brighter display at 900 nits, yet is physically smaller and has a higher resolution, removable battery and storage, USB-C. Plus the G5 adds a new bottom slot for new hardware modules. There is no comparison. 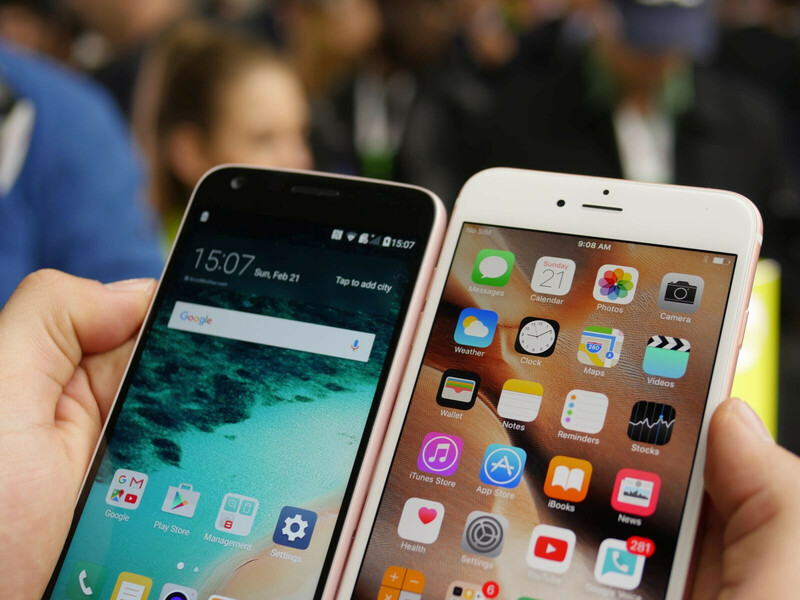 The G5 is superior and should be compared to the smaller iPhone 6s. But we all know how inferior hardware wise the iPhone 6s really is. Only an idiot would layout all that money for the inferior iPhone 6s. What a shameful comment. Your making Apple fans look stupid, LG has not lost and still makes great phones. Why the smaller screen? Smaller battery? The hideous camera hump? You had your design language down and only needed to step up your build quality. Work on the hardware issues that plague the G3 and G4. Hope the V10 successor doesn't follow in the same direction.